When LifePharm opens the direct delivery to Trinidad and Tobago, it will include all towns and cities in T&T. Arima, Chaguanas, Couva/Tabaquite/Talparo, Diego Martin, Mayaro/Rio Claro, Penal/Debe, Point Fortin, Port of Spain, Princes Town, San Fernando, Sangre Grande, San Juan/Laventille, Siparia, Tobago, Tunapuna/Piarco. 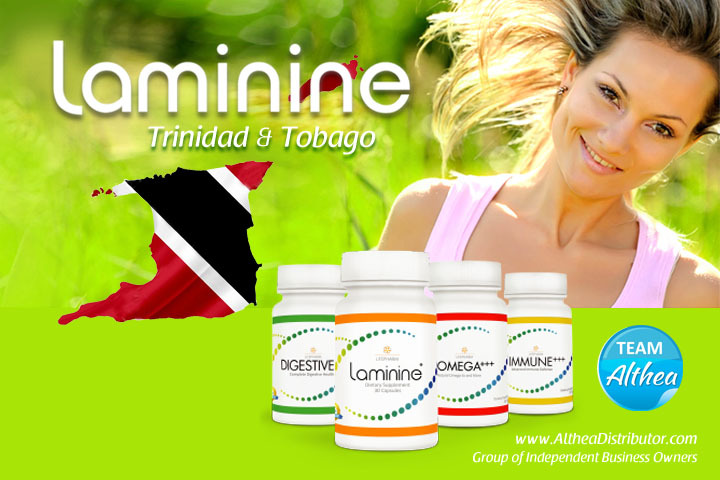 Laminine food supplement is already available in Trinidad and Tobago, through our local distributor in this country. If you wish to order the product, please contact any of the distributors listed below. Laminine in Trinidad will be priced according to USA standard global price when the system goes online, you need to order minimum of 3 bottles (Activation pack or signup). For now, Laminine is priced in TT at around US$D55 per bottle, depending on dollar exchange. No minimum required. You can ask local distributors for stock availability. When direct delivery is open, all orders will be processed in 2-days and shipment from the USA hub to Trinidad and Tobago in approximately 10 to 14 working days. LifePharm currently does not deliver directly in Trinidad but we can make a special arrangement for product delivery. Please send us an email. Sorry but we do not have a Laminine distributor by that name.